Companies in the infrastructure sector remain cautious over implementation of projects, despite the government’s plans to ease financing and de-risk private players. The Budget for 2015-16 has proposed to set up a National Investment and Infrastructure Fund (NIIF), with an annual outflow of Rs 20,000 crore, to enable it to raise debt and, in turn, invest as equity in infrastructure financing companies like Indian Railway Finance Corporation and National Housing Bank. “Banks have been cautious about lending to infra projects; they have been waiting for a turnaround before increasing their exposure. So, the infrastructure fund is a positive step,” says Rupesh Agarwal, vice-president, EY. This can potentially help raise an additional Rs 50,000-60,000 crore through government equity and debt for investment in infrastructure.. The government also intends to bear a major part of the risk in infrastructure projects in public-private partnerships. Besides, it plans to allow tax-free bonds for projects in railways, roads and irrigation. “The government has made all good intentions in the Budget; this was required. But now we have to see the finer prints to understand how this will be implemented,” says Issac George, chief financial officer, GVK Power & Infrastructure. The government also announced its plans to corporatise the country’s government-owned ports. Besides, it plans to bring five ultra mega-power-projects (UMPPs) of 4,000 Mw each. This will provide long-term order visibility for capital goods companies, as there are no projects due for completion after 2017. 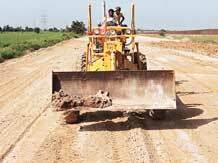 The government has increased outlays on infrastructure for 2015-16 by Rs 70,000 crore to Rs 3.17-lakh crore, as it intends to allow a higher budget deficit target to spend on roads and bridges instead of subsidies. This is expected to stimulate private investment, which fell to 8.5 per cent of gross domestic product in 2013, the lowest in government data since 2005. Previous governments cut spending on infrastructure to narrow their fiscal deficits. Subsidies accounted for 15 per cent of total spending in the current year’s Budget, compared with 10 per cent a decade ago, while expenditure on roads, ports and power plants dropped to 6.2 per cent from 10 percent during that period. “Some of the major issues facing the infrastructure sector have been addressed,” says Anand Rathi, chairman of Anand Rathi Securities, referring to the land acquisition issue being addressed through an ordinance and financial constraints being eased. The environment clearance issues, too, have been addressed by the government. “With these efforts, we are expecting an acceleration in private-sector investment in the infrastructure space,” he says. The sector was expected to wrap up the current financial year with a growth rate between 7.5 and eight per cent. This will be the highest growth rate for the sector in five years.